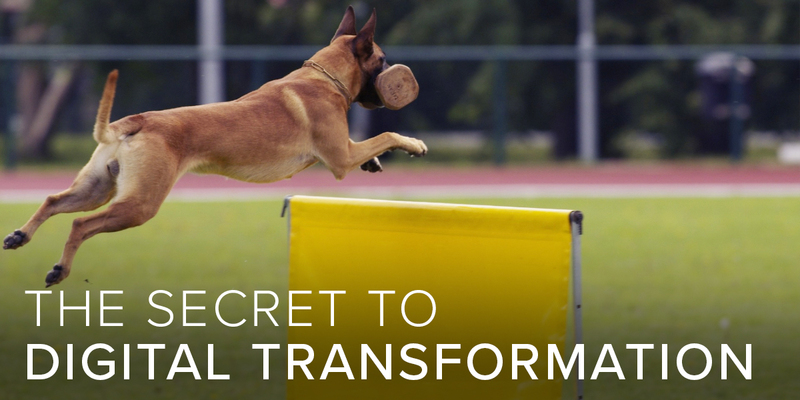 There is a secret key to unlocking digital transformation’s business value. The secret isn’t in the data; the secret is the data. If you take away only one idea from this article, make it this one: digital transformation is a data race. How do I know this? Because everything is a data race. I’m stealing this phrase from a good article in Sloan Management Review, “The Machine Learning Race is Really a Data Race,” by Megan Beck and Barry Libert. They’re right. Machine learning is about data, first and foremost. My generalization of their claim is that everything in IT, now and for the forseeble future, is a race to make sense of the data in such a way as to drive strategic business objectives, including reducing costs, increasing insight into the preferences or behavior of others, optimizing business processes, etc. All good things come from the data in theory, but in practice the data is an acrid dumpster fire. The work of digital transformation is to bring practice into line with theory by managing data in a new way. We think Knowledge Graph is the new way to manage data. Increasingly, so do our customers. The goal of digital transformation is to treat data like it’s an asset. In some cases that means to effectively monetize data. In other cases it may mean to derive insight from data that leads to value creation. In yet other cases it can mean to use data effectively as the basis for strategic decision making. Even governments and their political constituents are demanding evidence-based policy. Imagine such a thing! None of this will replace the sudden flash of insight that so often leads to revolution in human affairs, but, ideally, it will replace all that tired old opinion-mongering that too often masquerades as expertise. You know the kind of thing I mean, even if I only obliquely allude to it. No, that person can’t win that election! No, that referendum will never pass! In an era in which so much elite expertise has turned out to be wrong, there is comfort to take in the growing commitment to being “data driven”, not least since that commitment is central to scientific endeavor, which I think is one of the best things about humanity. Okay, so far, so good. But then why is digital transformation hard? After all, it’s obviously valuable and clearly we know how to “do science”? I think digital transformation is hard for two obvious reasons, one of which is essential and the other of which is contingent. Digital transformation is hard for the essential reason that the underlying activity, that is, scientific inquiry, is in fact hard, both conceptually and practically. There’s a reason most basic research is funded by governments, that is, not funded by profit-seeking entities. Getting insight isn’t easy; reality does not yield its secrets willingly. Since “data science” is not just a metaphor, it is in fact dependent on a kind of scientific inquiry, which doesn’t always neatly fit into a quarterly financial reporting structure. But digital transformation is also contingently hard because of history, namely, the history of IT. Digital transformation requires data mastery and the legacy of IT is such that data mastery is not a simple thing to achieve. There are just too many things. Too many data formats, standards, data types, velocities, schemas, systems, databases, silos, methodologies, models, etc. The sheer diversity of the modern enterprise IT landscape is daunting. A common move in scientific inquiry is to summarize over or abstract away from the messy details of reality by offering a unifying theme that makes them cohere. I make that move here by saying that data mastery requires a plan for dealing with data silos. Follow my causal chain so far: competitition requires digital transformation which requires data mastery which, in turn, requires a plan to deal with data silos. Stardog is a Knowledge Graph platform and the essential business value of it is to be a data management solution to the problem of data silos. Working backwards, then, we say that Stardog is a key element of digital transformation, especially in large enterprises with appreciably complex IT and data environments. Such organizations always, always have Stardog-shaped problems because they always, always have data silos. But aren’t all these problems solved with enterprise search? I mean, Google is a search company, right? Well, yes and no. Search is an important enterprise data service, and we’re happy to see companies like Elastic doing well. Our hats are off to them. That being said, no, Google is not (just) a search company (any more) and search isn’t always enough. Search is only a starting point. Search misses correct answers and in that sense it’s lossy. That’s just how information retrieval systems work and it’s not a criticism of them to point it out. Search may also include wrong answers. When you only need one correct answer, it’s just not a big deal that your enterprise search system includes some wrong ones and doesn’t include some right ones. But a great many business problems—for example, consider GDPR—require all and only correct answers. For all those use cases where the right answer requires precision and recall to be maxed out, you really want a query-answering system as distinct from a search system. Finally, search alone does not offer a user experience that’s optimized for accidental or incidental discovery. As one of our customers put it recently, search doesn’t give you anything to wander around in. It doesn’t give you any way to browse the data to learn more, to discover more, or to just get a “feel for it”. This big pharma customer has learned that search doesn’t encourage the kind of data familiarity that often leads to flashes of insight and the generation of new hypotheses. Search isn’t great for learning. By contrast, taking a walk over the Knowledge Graph is exactly how people learn new things, even if their entry point to that graph—as in the case of Google—is via a search. I will close this article by restating some basics. Operationally, a Knowledge Graph is a data management system for the purpose of data unification and which includes capabilities like a graph database and a knowledge toolkit. Conceptually, it’s a single system that queries any data type, any data velocity, at any data location and returns sound and complete answers. the answers to all business problems exist solely within organizational lines of business. nearly all business problems systemically cross lines of business. While our world is admittedly very imperfect, it has the incomparably great quality that it is the actual world, one in which large enterprises are faced with a need to accomplish digital transformation by achieving data mastery. And in this our actual world, Stardog is here to help. Learn more about what a Knowledge Graph is and how it can connect your data, no matter where it is or what type it is.